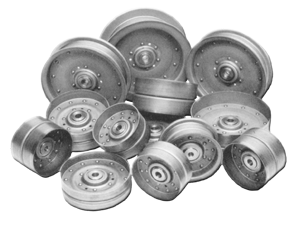 This Don Dye line of heavy duty double row ball bearing flat, flanged, and V groove idlers was developed to handle heavier loads that exceed the capacity of single row ball bearing idlers. 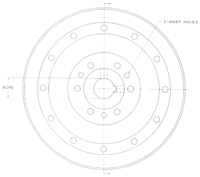 The double row idlers are more stable when side loads or off center loads occur. They are available with 3/8", 1/2", 5/8" and 3/4" bolt mounting. These riveted idlers are constructed from 13 gauge material. The high quality precision bearings made of 52100 bearing steel are pre-lubricated, have contact type seals for retention of high temperature lubricant to ensure protection against dust, dirt or other foreign matter. No re-lubrication is required. A compression ring is compressed between center of O.D. of bearing and center I.D. of pulley bearing pocket to assure a firm reliable fit of pulley more evenly to the outer bearing race resulting in minimum distortion of bearing O.D, (USA patent 4518372 foreign patents pending). Our tests have proven this method of bearing installation to give longer and more reliable bearing life.